Last week we told you about a great sale on the most compact version of everyone’s favorite smartphone accessory, and we have some great news for anyone who missed out: the deal is still going now, but it’s your last day to take advantage of this great sale. 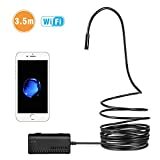 The Depstech WiFi Borescope 2.0 Megapixel HD Snake Camera connects to your iPhone or Android device wirelessly and can then be snaked into just about anything. There are also handy attachments like a mirror that can see around corners and a hook tip that lets you retrieve lost keys or jewelry. Tens of thousands of our readers have picked up one of these awesome camera accessories over the years, and the coupon code XHUQOC66 will ensure that you get the lowest price when you join them.